Labor Day is a holiday that the honors the American labor movement and the contributions that workers have made to the strength, prosperity, laws, and well-being of the country…but for me, it will always be the anniversary of one of the scariest days of my life. Ten years ago on Labor Day, my water broke twenty-one weeks before my due date. Even though it’s been a decade, I remember the night like it was yesterday. I woke up at one in the morning absolutely drenched with sweat. Los Angeles was having a late-summer heat wave and I was really feeling it. I laid in bed for a few moments, unsure of why I’d woken up until I felt the baby press on my bladder. Thinking back on that, it makes me sick. I still should have gone to the hospital. But I hadn’t learned how to be an advocate for myself or my baby. I hadn’t learned to trust my gut. My doctor told us to wait, so we waited. I wonder (more than I should) if things would have turned out differently if I’d gone to the hospital that night. I also wonder why NONE of the doctors who treated me over the next ten weeks said, “Hey, you know what, you and your baby would be better served at a different hospital with better resources and high-risk specialists.” I didn’t know any better, but they did. I carry so much guilt, even though I know I shouldn’t. I would give anything to tell the Heather of ten years ago to go to the hospital. To trust her instincts. But instead, I’m writing about it with the hope that if something like this happens to anyone else, they’ll know what to do. Have confidence in your intuition. Go to the hospital. Ask questions. Get second, third, and fourth opinions. Insist on it. That Labor Day ten years ago changed my entire life. I can’t travel back in time, but maybe my experience will help someone in the future. Maybe then, some of the guilt will go away. Finally admitted to the hospital, six weeks after my water broke. That is awful. I’m so sorry this happened. You are amazing for sharing your story. I’m at a loss to even know what to say. It’s awful that your treatment wasn’t adequately addressed, and worse that it’s YOU that’s left wondering what if, rather than the healthcare professionals that made all the choices. I admire your persistence to keep speaking and educating about premature births and options out there for families going through a similar ordeal. It can’t be easy to share this, but I hope you get some comfort out of the difference you are making. Wow, I can’t believe it’s been ten years. I have been following you since shortly after Maddie was born. I’m sure this message along with several others you have written have helped many many moms. God Bless you and the family. Maddie will always be watching over you. Love you. Love Maddie. Love the rest of you Spohr people. I hate that you carry that guilt. You don’t deserve that burden. I would say, “Don’t feel guilty” but I’ve recently learned for myself what a ridiculous thing that is to say to a grieving person. My grandma (really, my parent) has been gone for 3 months and I am wracked with guilt and what-ifs – not about her illness or death in this case, but about ways in which I wasn’t there for her the way she was always there for me. I would give almost anything to be able to have one more talk with her and tell her how sorry I am. Guilt is just … part of grief. Part of human nature. The best I can say is, “I WISH you’d didn’t feel it.” You did everything possible and fought so hard for Maddie. You still do so much in her memory and honor. Life can be cruel. Really beautiful too, of course. But also cruel. Heather, please don’t feel guilty! You were very young and Mike too! The people learn things from the experiences, so you are thinking now that you could have done lot of things to save Maddie, but you did everything you could do at that young age! I really don’t think the doctor gave you any wrong information. Sometimes unexpected things happen and at that right moment we don’t know what is wrong or right! You did amazing job to stay in bed to keep Maddie healthy! You did not do anything wrong! Thank you for sharing this Heather. you are so right that the people with all of the information and knowledge did not give you the full information. Thank you for shouting from the rooftops to trust our intuition. 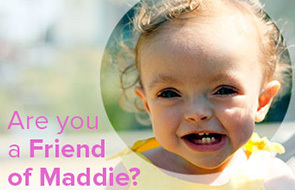 The hard work you did created Maddie’s beautiful life and the platform for all of,us to learn about the ways we can help advance maternal care and premature infant care. I am still surprised at the number of stories I hear of Doctors who do not listen to basic information or intuition from their patients. Thank you for continuing to advocate for all of us and to remind us to continue to advocate for ourselves. You are such an outstanding mother of three! It does help others to know your story. My situation was different, but partially because of you I kept fighting for Kaiser to recognize that something was wrong. The first time I went in when I was almost 29 weeks because my BP was high (166/93) they monitored me for an hour or two and then sent me home and told me not to take my BP anymore. I ignored that and was back in 2 weeks later at which point they gave me the PIH diagnosis and I went in again when my BP kept going higher a week after that. Oh Heather, this tears at my guts and breaks my heart…and angers me. Because you’re right: THEY knew better. And you and Mike and Maddie deserved the best possible care. I’m so very, very sorry. If it helps, because of stories like yours, my sister got the hell out of the hospital that was mishandling her delivery (she now “owns” a medivac helicopter $$$), and got to a 1st rate hospital where both she and my (now 8 month old) niece were treated with the proper medical care they needed. Needless to say, that 1st hospital was told where they could stick their bills & the 2nd hospital said they would fight on her behalf in not paying them. We are lucky she & my brother-in-law listened to their instincts or we could have lost both of them. You & Maddie are saving lives. But it should never have come at such a great cost to your family. I love you, dear one. And Madeline Alice always lives on in my heart & mind, even though I didn’t have the privilege of actually meeting her in person. Her smile and those blue eyes and that wonderful personality won my heart the first time I accidentally stumbled upon this blog so many years ago. Sending you love and comfort wishing life were different in so many ways. ? That last question mark was a heart. Bummer. Heather of 10 years ago may not have known how to be an advocate for her baby but your story has taught me how to be one for mine. I switched doctors during my last pregnancy because I felt the level of care we were getting was subpar. I ended up having a closely monitored pregnancy and early delivery due to preeclampsia when the other doctor told me my blood pressure was “fine.” I knew it wasn’t. Your story may be hard to tell but it’s saved many babies. I’ve read you daily since Maddie was a young toddler, and I never knew this part of your story. You are a tremendous advocate and brave soul, and I agree with the others who say you’ve saved so many babies. Lots of love to you. Heather, echoing what so many others have said, hearing your story helped me be able to fight for my daughter. Those days of disagreeing with doctors, calling specialists, changing hospitals, changing back were overwhelming, and you helped me have the strength to keep pushing back as my concerns were disregarded. I wonder if your doctor was just jaded/cynical/burned out. Having a hard time to give hope when she has seen bad things. Not an excuse but wondering if it colored her recommendation to you. Lots of love as always. I hate that you shoulder this guilt but you and Mike show how to do it clumsily, gracefully and survive.